A spacious pub split into 2 parts, bar and food lounge. 2 dart boards a pool table and sky sports. Locals were friendly enough and pub is comfortable. No real ales which is a shame so opted for the Guinness, would call here more often if they served ale. 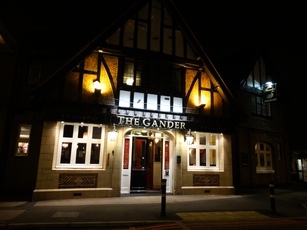 I went to The Gander Inn in Gander Green Lane in Sutton for a quick, quiet drink and a bite to eat after delivering mayoral election leaflets . I was greeted by two rude bar staff, including one named James. They were rude only because I wanted a receipt. For that he tried to get me to leave, and that's in spite of having already bought a round of drinks (and shortly afterwards some food). So this is a pub to avoid. If someone buys food or drinks with Apple Pay or a contactless card, they should be politely offered a receipt without argument as proof of purchase (not giving a receipt leaves the customer with no record of what was purchased. Apple Pay only details the cost and not the items bought). 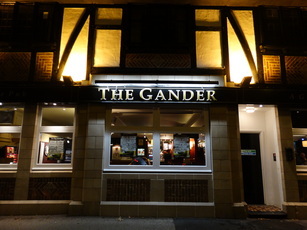 Great Pub, Great, Staff, Excellent food!! Number 1 around for sport & atmosphere. Looking good after new refurb.Food was again excellent,as was my beer and the bar prices.Good for sport with plenty of screens.